It’s common for web developers to use CAPTCHA (Completely Automated Public Turing test to tell Computers and Humans Apart) functionality for anti-spam verification to make sure HTML form responses are being generated by humans and not computer “bots”. People with visual disabilities use screen readers that cannot read a CAPTCHA. You cannot add ALT text to a CAPTCHA image, because then a bot would be able to read it, defeating the purpose of using it. Audio CAPTCHAs present difficulties for people with hearing disabilities. Use a question rather than an image or audio to create CAPTCHA functionality. Another way to challenge: use math questions (e.g. “What is one plus three?”). For those of you who use PHP, here’s a simple coding trick that enables you to create an accessible CAPTCHA on an HTML form. I have used this for years on client websites, and it works great. At the bottom of your form, create a text field named Validate. 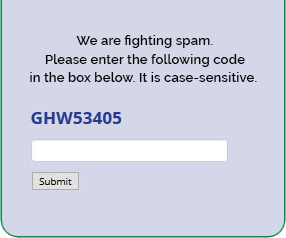 Above the field, add a validation text code of capital letters and numbers (in this case GHW53405) that the user will need to enter in order to submit the form. Also let the user know that the validation code is case-sensitive. Note that in the PHP condition you need to change the values of the capital letters used in the validation text code to lowercase (see bold above). The PHP function strtolower converts all the text characters of the submitted Validate string to lowercase. If the validation text code has been entered correctly, the rest of the script will process with no problem. If the validation code has been entered incorrectly, the submission will fail and the user will be directed back to the form.